I was lucky enough to get a trip to Cape Town this June. It was only a very short trip, as I was accompanying my husband to a Conference. Nevertheless, I saw some wonderful things. For my full Blog Post, click here. I was fortunate to take two trips up to the top of Table Mountain. One trip on a sunny, but chilly day, the other on a dreary, rainy day with very low cloud over the mountain. Both unique in their own ways. The Conference kindly arranged tours for the visiting wives. One tour took in The Bo-Kaap. This area of Cape Town has steep streets, lined with beautiful, brightly colored houses. This predominantly Muslim area still houses descendants of slaves from Malaysia, Indonesia and various African countries, who were brought to the Cape by the dutch during the 16th and 17th centuries. The slaves were known as "Cape Malays" although most of the residents were not entirely of Malaysian descent. However, the term stuck and Bo-Kaap is also known today as the Cape Malay Quarter. For more on The Bo-Kaap, click here. The wharf and harbour area of Cape Town has a distinct "San Francisco" feel to it. The tHarbour consists of two basins, the first named after Prince Alfred, the second son of Queen Victoria, who began building the harbour in 1860. The second basin built to accommodate the growing shipping, was named Victoria, after his mother. Now a major tourist attraction, (nearly 10 million visitors a year come here), the V & A Waterfront boasts many shops and restaurants. The Clock Tower Centre area of the wharf houses the Nelson Mandela Gateway to Robben Island. It also has the original Clock Tower built in 1882 to house the port captain's office. Unfortunately, I did not get chance to go to Robben Island. The 3.5 hour tour begins with a ferry ride from the Waterfront. I had not realized that the last ferry was at 3pm. We visited the Cape Point Ostrich Farm, and the Penguin colony at Boulders Beach, just outside Simons Town. All this on a day trip we took by ourselves. We rented a car and drove down the Cape Penninsular to Cape Point and the Cape of Good Hope. Some brilliant views from the most Southerly, and the most South Westerly points of the Continent of Africa. A great, if chilly day out at Aquila Game Reserve. 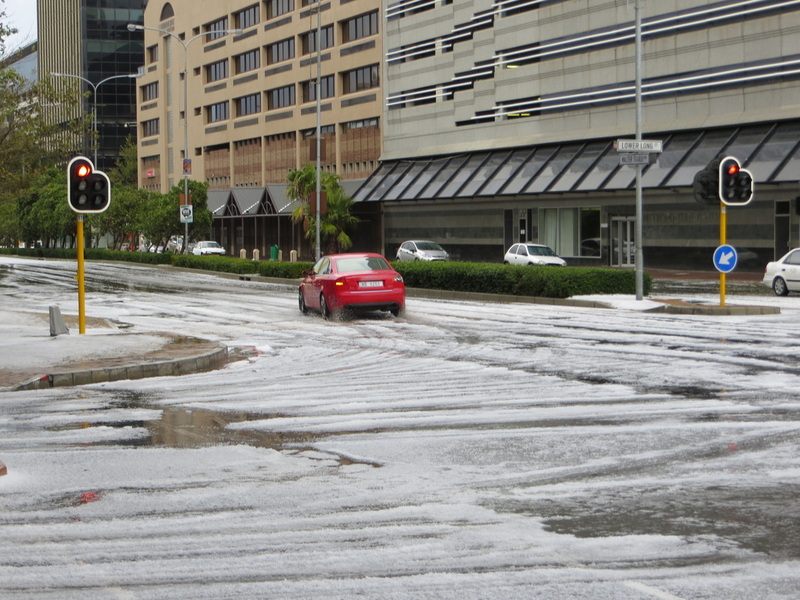 While we were in Cape Town, we witnessed a freaky bit of weather. 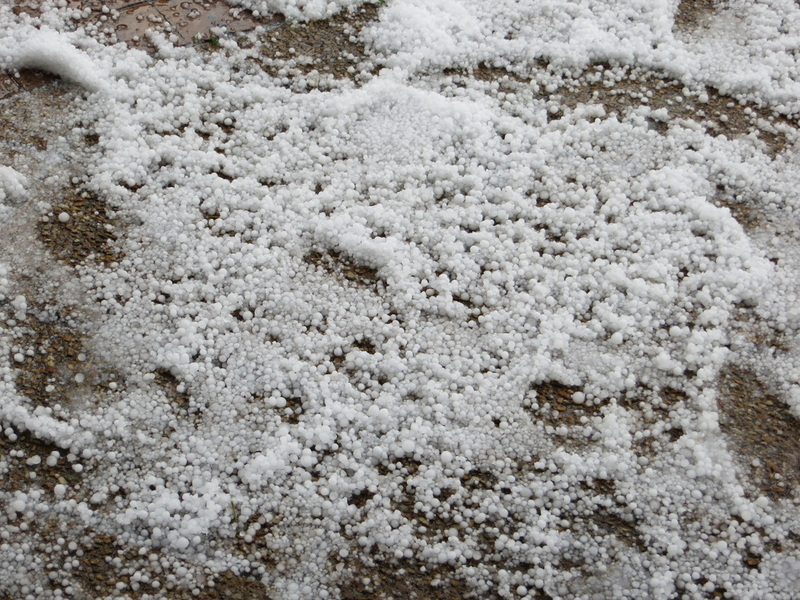 Although it was Winter time there, it was a little strange to see a hail storm. Everyone was really shocked. 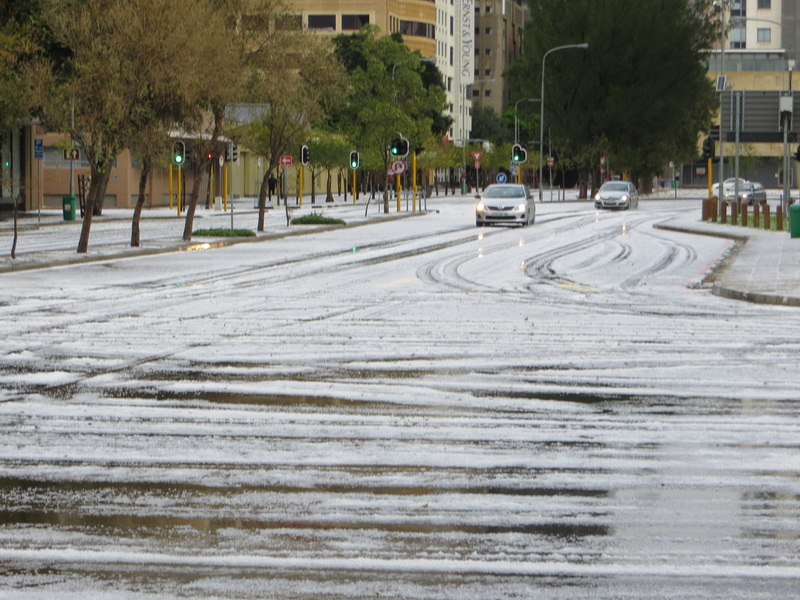 The hail came down very fast and thick and it almost looked like it had snowed.